1 of 4 Prepare charcoal grill with medium-hot coals or heat gas grill to medium-high. Whisk 4 tablespoons of the oil, the vinegar, garlic, oregano, salt and pepper. Set aside. 2 of 4 Brush tomatoes, eggplant and onion with remaining 1 tablespoon oil. Pierce sausage several times with the point of a small knife. Coat grill with nonstick cooking spray for grilling. Grill vegetables and sausages, turning often, 13 to 15 minutes or until sausages are no longer pink and vegetables are crisp-tender. 3 of 4 Meanwhile, cook pasta according to package directions. Drain; place in a bowl. 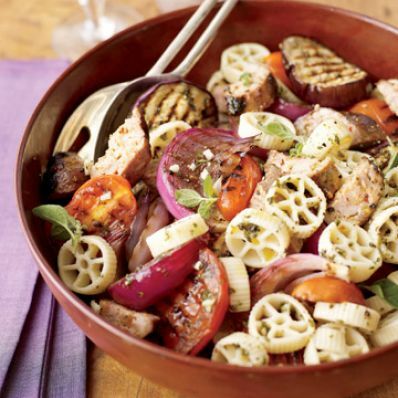 4 of 4 Remove vegetables from grill and chop; cut sausages into coins, then cut each coin in half and add sausage and vegetables to pasta in bowl. Drizzle with reserved dressing and toss to coat. Serve warm or at room temperature. Per Serving: 36 g carb., 26 mg chol., 550 mg sodium, 23 g Fat, total, 6 g sat. fat, 4 g fiber, 12 g pro., 382 kcal cal.